SC&K Interviews Steve Braden, the "Cagey Veteran" of sea kayak guiding and instruction here on the GA Coast! Illustrator, naturalist, and AT through hiker, Steve Braden has paddled the length of the GA Coast more than anyone we know. 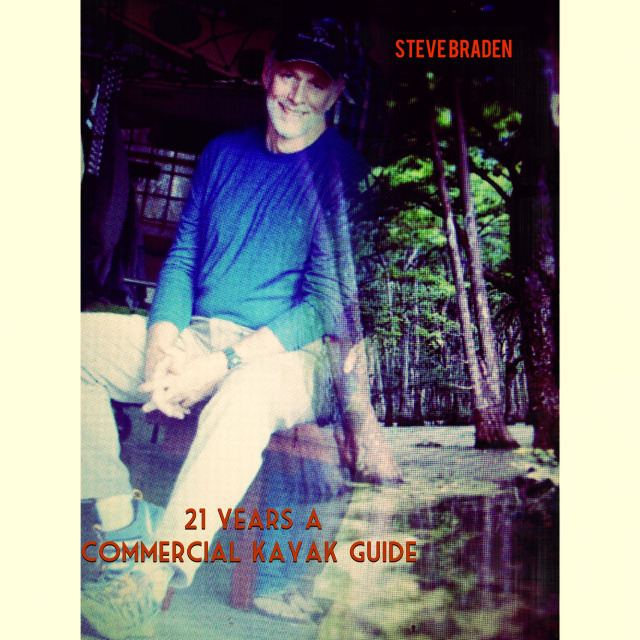 With enough knowledge and gathered material to produce a comprehensive coastal kayak guidebook, Steve is a true asset to the SC&K team. SC&K recently interviewed Steve, as we celebrate and salute him in his 21st year as a lead sea kayak guide and instructor. How did you first get started paddling? My first paddling experiences, at age 15, were in a canoe at a YMCA camp in north Georgia. Not all of those experiences were encouraging: I remember being catapulted out of the front of my canoe when the sternman—one of the camp counselors—steered us bow first into a rock in the middle of a modest waterfall on the Chattahoochee River. My start as a sea kayaker began with a Red Cross sea kayaking class at Lake Mayer, with David Mason, Lynn Laycock, and Mike Robinson presiding. It was a great class and I was hooked. Can you credit any particular people or resources for your skill development and inspiration as a paddler? This applies to both early in your career and currently. Yes, but they would be too numerous to list! After taking the class, and before I was able to afford my first sea kayak, I read lots of books by Derek Hutchinson, John Dowd, David Burch, and others. As inspiring as these were, getting my first boat—a plastic Aquaterra Sea Lion—was of course the key to developing skills. In my first year I became very proficient at making lots of mistakes, many of them more than once. So I would be remiss if I left out Experience and the Atlantic Ocean as two demanding but gifted instructors. I continue to learn from the paddling community here in Savannah. You know who you are, so please forgive me for not listing you all by name. It’s been my privilege to paddle with you. What is your favorite Island on the Georgia Coast and why? I’ve had so many nearly magical experiences on so many of them that it’s difficult to choose one. I’ll say Cumberland Island, which I have been visiting since the 1970s, first as a backpacker and much later as a sea kayaker. The first time I went there I thought the wilderness area must be what paradise was like, even with the bugs. It is the largest of the Georgia coastal islands and probably the most diverse. And one of the most fun ways I’ve found to experience that diversity is to not stay on the trails. Can you share one of your most memorable paddling experiences? On a beautiful August evening in 2009 I was sea kayak surfing with some friends. What you are doing when you are surfing is attempting to move in harmony with a wave you’ve chosen, and one of the waves I chose that evening was a very good one. I saw that it was sufficiently strong and steep enough to try an ender and pirouette. I had done these before, and have done them since, but this one remains my best. I stood the kayak up on its nose—the ender—and gave a twist for the pirouette. It wasn’t perfect, since I came down slightly sideways and had to brace back up. But it was a perfect moment—the water, the light, the exhilaration, the sheer fun of it, and the total engagement with what I was doing. Mike Robinson once said that sea kayaking is very much “in the now.” And it’s true. What's the best advice you can give to someone who wants to be an instructor or guide? Be prepared to be a Renaissance man or woman. You will need to know a lot about a lot—sea kayaking, of course, but also weather, tides, risk management, navigation, natural history, and cultural history, among others. I am still learning (and relearning!) after 21 years, which I think is a measure of the richness of this profession. Also, at different times you will need to be a coach, a confidant, a counselor, and a commander, as well as the voice of reason and caution. And you will need to know when to be each. And finally, what is your favorite musical album? Conan the Barbarian: The Complete Original Motion Picture Soundtrack by Basil Poledouris. Click here to listen to Steve's paddling soundtrack on Spotify! Thanks, Steve! We're so glad to have you on our team here at Savannah Canoe & Kayak. We look forward to another great season filled with your paddling enthusiasm and wisdom.